Our New Mat Fundraiser is Live! As you probably know, we’ve had a lot going on this year. I am, along with Michael Freidl Shihan, co-host of the Aiki Summer Retreat. The last few years, we’ve held the Aiki Summer Retreat in Quincy, California. Until this year, we’ve been spending thousands of dollars each Retreat on renting mats. So we decided to buy our own mats. We were fortunate enough to buy mats with our friends at Aikido of Santa Cruz. The mats we bought cost our dojo around $5,000. Since we don’t have enough space to safely store all of the mats in the dojo, we bought a storage container. 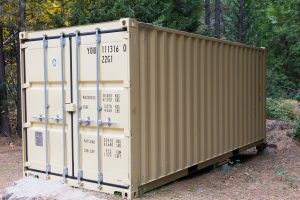 That storage container cost around $3,200. We plan on using some of these new mats to create a new, beautiful dojo mat with a floating floor. The new floating floor will be much gentler on everyone’s body and make training easier and more fun. Problem is that the floating floor is probably going to cost another $3,000, or so. In other words, this new mat process is costing the dojo over $11,000. And, we’ve kind of run out of money. So, I’m heeding the advice of my friends and we’re doing a dojo fundraiser. We’re looking to raise $5,000 to cover the cost of the new floating floor and recoup some of the other expenses. We really could use your help! For more information and to donate to our new mat fundraiser, please click here.